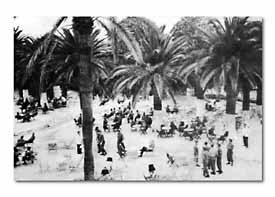 More than Paris and London, some soldiers favored as a rest spot the internationally storied Riviera. 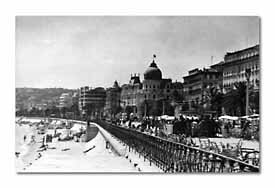 The Cote d'Azur had much to offer; a swanky boardwalk promenade, sprawling hotels and casinos, the incomparable Mediterranean and spacious beaches. With the officers billeted in Cannes and enlisted men in Nice, a time-worn Army custom, saluting, was discarded. 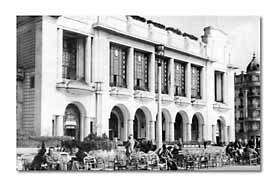 On the Riviera the men were served their morning newspapers, if not their breakfasts, in bed. At luncheon and dinner, orchestras played in the dining rooms of the better hotels. 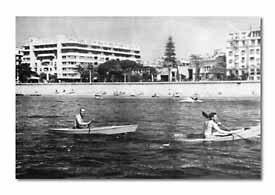 During the day there was swimming, fishing, tennis, bicycling and roller skating. Throughout Nice there were theaters with moving pictures in both English and French. Along the Promenade des Anglais in Nice, vacationing GI warriors found a long awaited paradise. Red Cross Casino Club was one of most beautiful service clubs of the war. It contained an 850-seat theater. Restees on the Riviera enjoyed water sports. In light Kayaks they frequently fished with spears. In a Florida-like grove of the Hotel Hermitage Terrace, GI's congregated for opening night festivities.